English: Crimson-breasted barbet; French: Barbu a plastron rouge; German: Kupferschmeid; Spanish: Barbudo de Pecho Rojo. 6.7 in (17 cm); 1.4-1.8 oz (39-52 g). 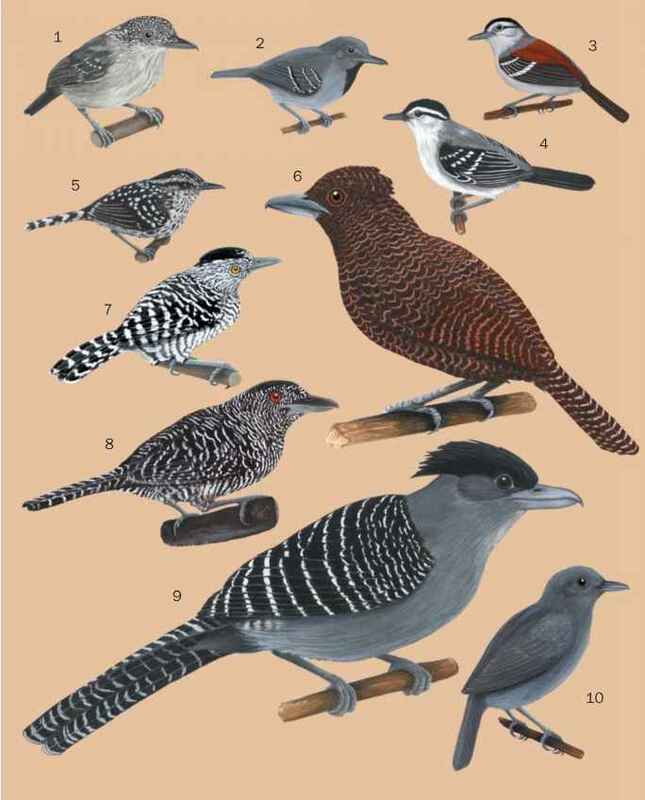 Adult birds are unmistakable. Upperparts are dark green; underparts are pale greenish with broad, dark green streaks and a red band across the upper breast. Forecrown is red; sides of head and throat are yellow; eyestripe and submoustachial stripe are black. Peninsular and northern India, northeastern Pakistan, Nepal, Bangladesh, and Sri Lanka to southwestern China, Malaysia, Sumatra, Philippines. Forest edge, dry deciduous woodland, teak forest, irrigated orchards and plantations with figs and other fruiting trees; also town and city parks, gardens, ornamental trees, and edges of mangroves. tonk" all day and even on moonlit nights. Sound recalls metallic hammering. Forages in tree canopy and on fruiting trees, eating figs, pipals, guavas, mangos, and custard apples as well as smaller berries and many insects; taps and chips away bark to reach invertebrates. Lays 2-4 eggs (usually 3) in hole excavated in tree; both parents incubate for 14 days; chicks fledge after five weeks. Both parents feed chicks but they are abandoned as soon as they fledge, when female begins second brood. Not threatened and very common in most of range.